Acquired on 12 April 2014 at 17:18 GMT (19:18 CEST), just nine days after launch, this first image from Sentinel-1A captures Brussels and surrounds in Belgium. It was acquired in the satellite’s ‘strip map’ mode, which has a swath width of 80 km, and in dual polarisation. The image also shows a more detailed view of the city in the ‘zoom in’. Antwerp harbour is also visible in the top left. The green colours correspond to vegetation, red–blue to urban areas, white to high-density urban areas and black to waterways and low-reflective areas such as airport runways. Launched on 3 April, ESA’s Sentinel-1A satellite has already delivered its first radar images of Earth. They offer a tantalising glimpse of the kind of operational imagery that this new mission will provide for Europe’s ambitious Copernicus environmental monitoring programme. Rather aptly, the first image shows Brussels in Belgium, the seat of the European Commission. The European Commission leads the Copernicus programme and coordinates the broad range of services to improve the management of the environment and to safeguard everyday lives. ESA is responsible for developing the family of Sentinel satellites and for ensuring that the stream of data are available for these services. This first image of Belgium was captured on 12 April, just one day after the satellite was put into its operational attitude, and demonstrates the potential of Sentinel-1A’s radar vision. Since it was launched from Europe’s Spaceport in French Guiana, Sentinel-1A has undertaken a complicated routine to deploy its 12-m long radar and two 10-m long solar wings, as well as passing a series of initial instrument checks. The satellite is not yet in its operational orbit, nor is it calibrated for supplying true data. These tasks will be carried out during the commissioning phase, which will take about three months to complete. This preliminary set of images simply offer a taster of what’s to come. 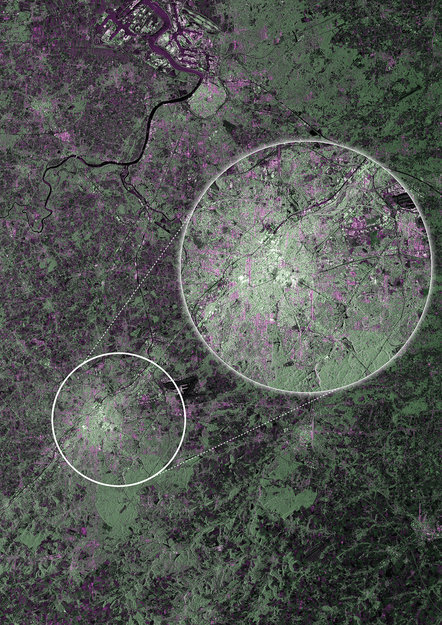 The first image, which was acquired in the satellite’s ‘strip map’ mode with a swath width of 80 km, clearly captures the dense urban environment of Brussels shown in white in the middle of the picture. Antwerp can be seen in the top left in red –blue colours and the greens depict vegetation in the surrounding areas. Waterways and low-reflective areas such as airport runways appear black. Among other applications, images such as this will be used for urban planning, for monitoring agriculture, for mapping deforestation and for managing water resources. This first set of acquisitions also included an area in Namibia that is currently flooded by the Zambezi river. Although commissioning has only just begun, the team tasked the satellite to image the flood as would be routine in the case of an emergency when the mission is fully operational. The images were then available in less than an hour once they had been received by the ground station. Sentinel-1A’s ability to ‘see’ through cloud and rain and in pitch darkness make it particularly useful for monitoring floods and for offering images for emergency response. 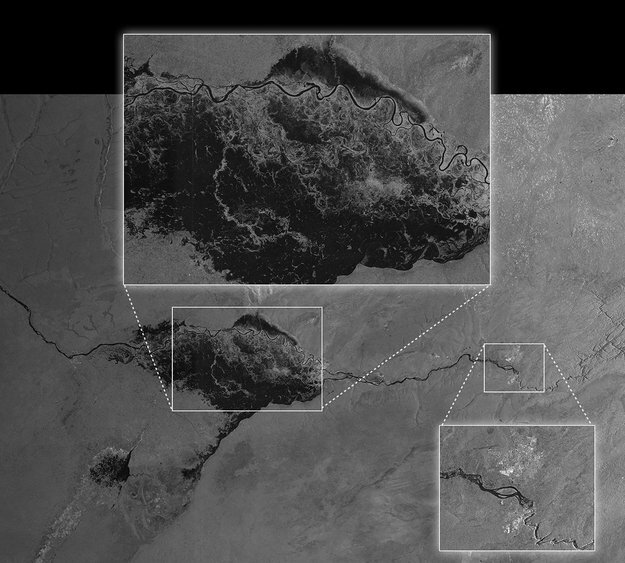 In fact, this area of the Caprivi plain was shrouded in thick cloud when the satellite acquired the image on 13 April. One of the images acquired on the same day focuses on Pine Island Glacier in Antarctica. This glacier is in a state of ‘irreversible retreat’ so it is important to keep a very close eye on glaciers such as these as they lose ice to the ocean. Another shows a transect over the northern part of the Antarctica Peninsula. As well as monitoring glaciers, Sentinel-1A is poised to generate timely maps of sea-ice conditions, particularly for the increasingly busy Arctic waters. 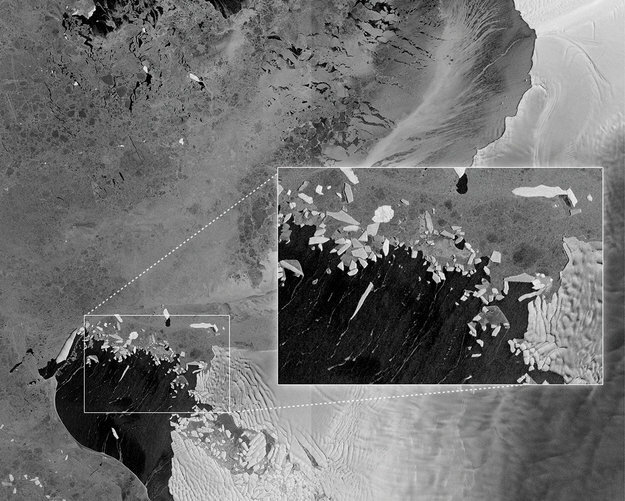 Images from its advanced radar can be used to distinguish clearly between the thinner more navigable first-year ice and the hazardous, much thicker multiyear ice to help assure safe year-round navigation in polar waters. As these first images show, Sentinel-1A is already demonstrating the vital role it will play in the largest civil Earth observation programme ever conceived. 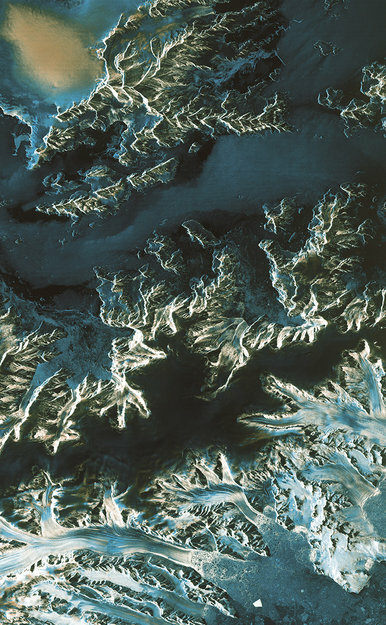 Acquired on 13 April 2014 at 23:57 GMT (14 April at 01:57 CEST) by Sentinel-1A, this image shows a transect over the northern part of the Antarctica Peninsula. It was acquired in the satellite’s ‘strip map’ mode with a swath width of 80 km and in dual polarisation. The colours indicate how the land, ice and water reflect the radar signal differently.